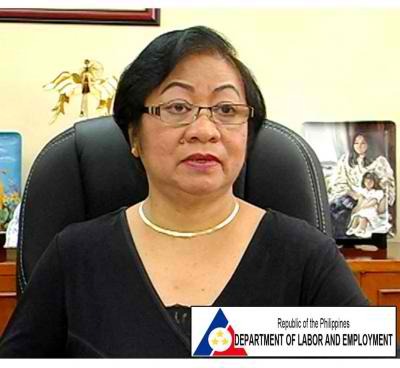 Labor and Employment Secretary Rosalinda Dimapilis-Baldoz on Thursday announced that the Regional Tripartite Wage and Productivity Board of the National Capital Region (RTWPB-NCR) has decided to increase the minimum wage in Metro Manila to P468. “DOLE-NCR Regional Director Alex Avila, chairperson of the RTWBP-NCR National Capital Region has reported to me that the RTWPC-NCR in a very cordial meeting had unanimously made a decision to increase the minimum wage by P10.00 per day to bring the minimum wage to P466 in the National Capital Region upon the effectivity of the new wage hike,” said Baldoz. “The RTWPB-NCR also decided to integrate P15 of the existing P30 Cost of Living Allowance (COLA) under RTWPB-NCR Wage Order No. 17 into the basic wage effective 1 January 2014. This will bring the new basic wage to P451 and the new minimum wage to P466,” added Baldoz. The minimum wage consists of a basic wage and COLA. The new minimum wage is contained in RTWPB-NCR Wage Order No. 18, signed by Chairperson Avila; Vice Chairpersons Rosemarie G. Edillon, Assistant Director General of the National Economic and Development Authority, and Director Ferdinand L. Manfoste of the Department of Trade and Industry; members representing the labor sector German N. Pascua, Jr. of the Trade Union Congress of the Philippines and Jessie L. Aguilar of the TUPAS; members representing the employers sector Vicente Leogardo, Jr. and Alberto R. Quimpo of the Employers’ Confederation of the Philippines. Avila said the new minimum wage applies to all minimum wage workers in the private sector in the NCR regardless of their position, designation, or status of employment, and irrespective of the method by which they are paid. Household or domestic helpers; persons in the personal service of another, including family drivers; and workers of duly registered Barangay Micro Business Enterprises (BMBEs) with Certificates of Authority pursuant to RA 9178 are not covered by the new wage order. Secretary Baldoz said that the RTWPB -NCR has increased the minimum wages in the NCR 12 times for a total of P268 per day, or more than double the P125 across-the-board wage increase that some labor groups have been clamoring for since 14 years ago. Relative to the new wage order, Secretary Baldoz has instructed Director Avila to use the issuance of the new wage order as an opportunity to inform and educate workers and the general public on the wage reforms the DOLE has been pushing, particularly on the two-tier wage system. Under the new wage order, the RTWPB-NCR shall issue a corresponding advisories on the 2nd tier, or the performance-based pay which shall serve as guidelines for private establishments on the range of productivity bonuses and incentives that an enterprise may provide based on agreements between workers and employers. “Our workers’ take home pay is increased to P11,240 per month, or by 2.1 percent, compared to the current P11,005 per month. Our workers will get a bigger 13th month pay of P11,651 or an increase of about 5.9 as a result of the COLA integration,” she added. The NCR Board shall issue the Rules and Regulations implementing the Wage Order within 10 days from its publication, subject to approval of the Secretary of Labor as recommended by the Commission. The new wage order shall take effect 15 days after its publication in a newspaper of general circulation.